Close your eyes and try to picture all the food at a Muslim celebration. Imagine the intoxicating smells of roasted lamb, goat, and chicken as they mingle with the aromas of allspice, cumin, spicy harissa, fried almonds, and honey. "Of course, I'm German-American, and my favorite thing is potato salad," Angie Odeh says. Odeh, who does media relations for Muslimmemfest, reminds us that Islam is an international religion, and, to reflect its cuisines more accurately, the food court at this year's Agricenter event will offer a diverse, international selection of choices. "But I do think people most enjoy a chance to try the ethnic dishes like shawarma or falafel," she says. "And there are definitely favorite vendors, but everybody else will get jealous if I say their names." 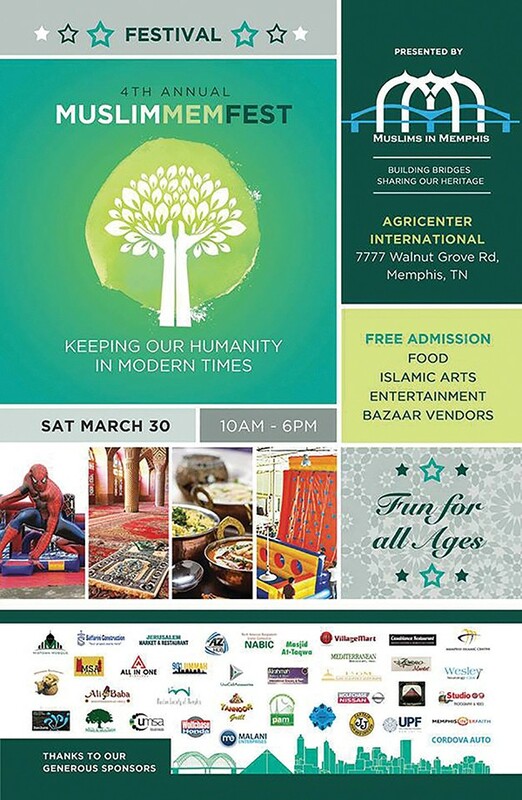 Now in its fourth year, Muslimmemfest is an annual cultural celebration created by the Muslims in Memphis organization to "strengthen the relationship between the diverse peoples of Memphis and Shelby County." In addition to sampling all that food, there are shopping opportunities and kids activities like bounce houses and climbing walls. "And a chance to rub elbows with Muslims," Odeh says. "One of our most popular booths is called, 'Ask an Imam.' We have our Imam there, and people can ask him anything at all, from super-serious questions to something simple. We started doing this at the first Muslimmemfest, and it was so popular we've done it every year since."